Prisco formulas address regulatory guidelines and the specifications of major press manufacturers. All sheetfed concentrates are buffered to resist pH drift caused by alkaline paper, contain anti-piling ingredients and are formulated to eliminate algae and fungus growth. These concentrates in turn produce cleaner reverses, enable better ink lay-down and assist in producing superior trapping. 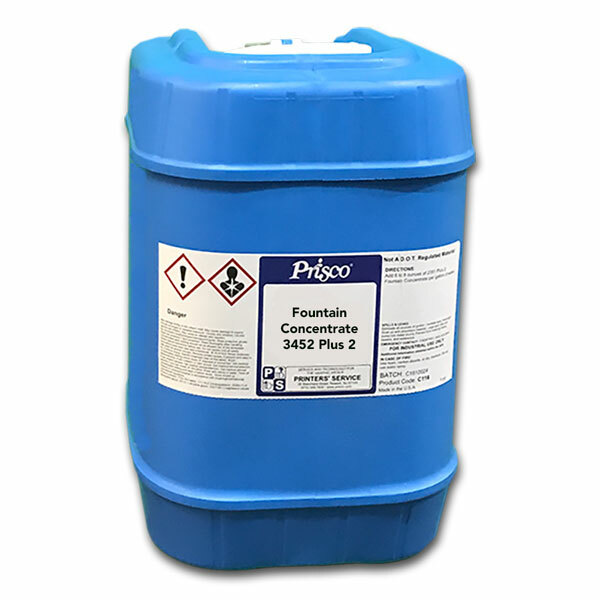 The following are our most popular formulas for use on sheetfed presses (other formulas are available to accommodate variables such as press dampening configuration, incoming water characteristics, ink type and substrates used). For use on sheetfed presses with PRISCO Alkaless R alcohol replacement. One-step containing extra gum for better desensitizing of non-image areas. Phospahte free one-step, ideal for water with low-medium alkalinity. A phosphate-free fountain concentrate for use with medium alkalinity water. Broad buffering for all water types, wide operating window. This product is the equivalent of a 3:2 ratio of 3451U and Alkaless 3000. Highly buffered one-step for sheetfed and business forms presses. Broad buffering capacity. May be used as one-step on conventionally dampened presses. A one-step for sheetfed, business forms and webs. Non-corrosive formula that complies with the requirements of press manufacturers and FOGRA. A non-corrosive one-step with FOGRA certification by KBA and Heidelberg. 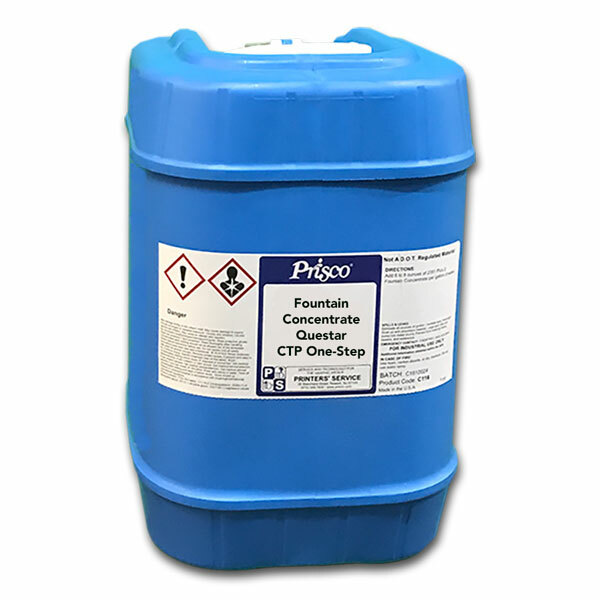 One-step fountain concentrate designed for use with CTP plates. One-step formula especially recommended for use with fast-reaction UV inks. Prisco fountain concentrates are available in various packaging formats depending on the region of purchase. For North America, these include: 5-US Gallon (18.9 Liter) cubes, 30-US Gallon (113.6 Liter) plastic drums, 55-US Gallon (208 Liter) plastic drum and 275-US Gallon (1041 Liter) totes. For Europe, these include: 25 Liter plastic drums, 200 Liter plastic drums and 1000 Liter IBC.